How To Make Crochet Earrings Without The Hassle of Crochet - My Daily Magazine - Art, Design, DIY, Fashion and Beauty ! Knowing how to crochet is such a great skill to have, but if you’re not particularly crafty, there are ways to get avoid it but still get similar looking results. 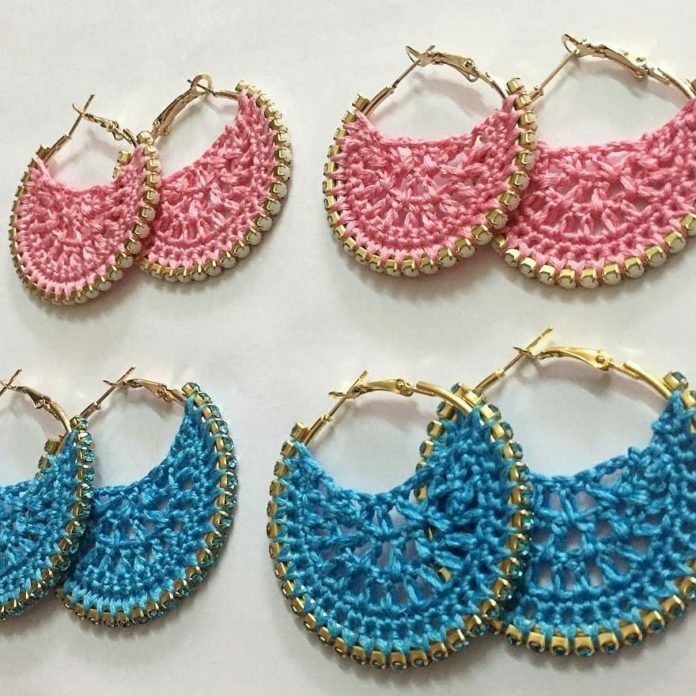 For example, if you are someone who loves the look of crocheted hoop earrings, you don’t have to go through the trouble of learning just to get the desired effect! Here is a step-by-step guide to making your own DIY crochet hoop earrings. Let’s get started. For this DIY, all you’ll need is friendship bracelet string and a pair of hoop earrings! Tie a knot, cut off the tail, and you’re ready to wear! Alternatively, instead of just wrapping the string, you can make what’s called a Chinese staircase by simply making knots throughout the hoop. Tie the piece of string to the hoop, pull the string out to make it look like a circle on the side, then put the string through the hole and pull. Continue doing that throughout the whole hoop and you’ll have an even more unique design!